Though a long lasting vocal and instrumental group, their career spanning 1946-1970, their time on the outskirts of rock ‘n’ roll was fairly brief and limited to a few sides on Aristocrat Records in the late 1940’s, both backing the label’s star vocalist Andrew Tibbs as well as cutting some sides of their own. Yet despite getting no commercial returns on these recorded efforts the group managed to carve out a solid reputation that kept them working for a quarter century. The group was formed in High School in Chicago after World War Two with the four members both singing and playing instruments, first doing gospel and then a year later, with a new lead singer in place, they switched to pop ballads. 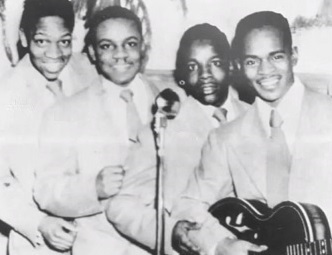 The foursome consisted of Bill Minor, lead vocals and drums, Eugene Teague, baritone vocals and guitar, Cornell Wiley, tenor vocals and the bass player, and Benny Cotton bass vocals. You can see none of them were named Dozier, but Wiley’s stepfather who helped them out financially was and so they named themselves in his honor and soon they were working regularly on the Chicago club circuit. It was here they were introduced to a number of artists connected in some way with the fledgling Aristocrat Records who were seeking anyone who could sing or play, both of which The Dozier Boys could do. They were initially enlisted to back Tibbs, the label’s top star, on a session. They not only sang behind him, giving those records a unique feel Tibbs hadn’t had before, but they also provided the instrumental accompaniment. The group was back in the studio a very short time after that for their own recording sessions except this time, save for Teague on guitar, they were only there to sing. The first date resulted in one pop flavored single backed by Sax Mallard’s group before they were brought back in along with a band led by Eugene Wright who they’d worked with extensively in the Beige Room club which resulted in The Dozier Boys first release in the rock realm. A full year later they were back in the studio for Aristocrat playing and singing this time on their last release for the company before it was taken over by employee Leonard Chess and renamed Chess Records but got just one release there before being let go. In spite of replacing an Army bound Cotton with Pee Wee Branford, a tenor vocalist not a bass which made their sound even “whiter” according to the OKeh Records A&R man, probably why their sides cut for that label went unreleased, the group didn’t lack for opportunities. They were always in demand for live gigs and in 1953 were signed by another Chicago label, United, at which time Cotton’s discharge made them a five man group. Their output still straddled the line between the outskirts of rock and more pop, or even novelty, material, all well done but they were now too far out of step with the ever-more aggressive rock sounds that were setting the pace and so they were always at risk for becoming anachronistic. By mid-decade their careers should’ve been winding down, especially after losing lead singer Minor, who got married, which meant Cotton took up drumming to replace him in that role, and Branford left around the same time for another gig, they recruited a teenager, Frank Bell, a sax player who sang high tenor. Other group members came and went, yet they actually wound up moving more towards mainstream rock on some cuts for Fraternity Records in 1957. In late 1958 Eugene Teague died on stage from kidney failure and the group was reeling for awhile without him, but carried on and had sporadic releases through 1964 on a few small Chicago labels, though they managed to remain active on the club scene. By 1967 in an effort to keep up with the times they changed their name to The Moving End and went to Vietnam for USO Shows, which had a dearth of black entertainers. Though unlikely that the kids fighting in the jungles half a world away from the United States heard of a group whose short-lived heyday came around the time they were born, they went and wound up teaching local entertainers in Da Nang for awhile before returning home and changing their name back to The Dozier Boys. No more recordings followed however and by 1973 they broke up. Wiley continued in music, playing and teaching, while the others drifted into other careers. Never stars, never full-time rock ‘n’ rollers, yet never exclusively sticking with anything else to be classified in another genre either, The Dozier Boys were the ultimate survivors in a field where the careers of even big stars wind up ending far too quickly.